Mario Party 6 is the sixth title in the Mario Party series made for the Nintendo GameCube and the third installment for that console. As with previous installments in the series, it was developed by Hudson Soft and published by Nintendo, and was first released in Japan on November 18, 2004, the only installment on the GameCube to be released there first. 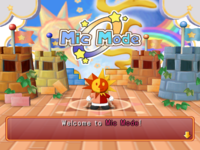 The game is the first in the series that features an installment of voice controlled mini-games using a packaged microphone, where an all new Mic Mode is designed specifically for microphone use; the microphone would later be reused in the next console installment, Mario Party 7. Additionally, Mario Party 6 supports the Nintendo GameCube's progressive scan mode. The main focus of this game is collecting Stars to stop the conflict going on with the sun and the moon to fill the Star Bank. 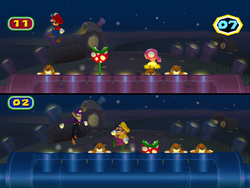 A new feature introduced to the Mario Party series is a day and night system implemented for boards and mini-games, a concept first introduced in Horror Land in Mario Party 2. As other Mario Party games, up to four players can participate in board gameplay and mini-games, where they can battle free-for-all or team up against each other. Mario Party 6 requires 5 blocks on the Memory Card to save the game, and up to three game files can be saved on the Memory Card. 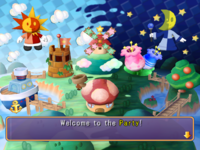 Brighton and Twila – the sun and the moon – watch over Mario Party World from the sky and host the best parties. The two celestial party animals have always been good friends. That is, until the day Brighton asked Twila, "Who's more impressive, you or me?" Brighton and Twila argued furiously over who was more popular and impressive. The sky thundered with the fury of their cataclysmic squabble! Mario and his party-hearty friends tried to get them to make up, but nothing they said could settle their spat in the sky. That's when Mario came up with a brilliant plan to harness the power of the Stars to end the feud! 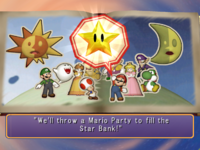 They decided to throw a massive Mario Party to collect Stars and fill the great Star Bank! Determined to end Brighton and Twila's feud, they started partying right away. ...But will the power of the Stars be enough to end the furious feud? The opening sequence to Mario Party 6. Brighton and Twila, the hosts of Mario Party 6, have watched over Mario Party World from the sky. Despite their close friendship, one day, Brighton asks Twila which of the duo is better. An argument then breaks out between him and Twila, and because it causes major disruption, Mario and friends attempt to calm them down. When they are unable to do so, Mario decides to throw a Mario Party to collect and harness the power of the Stars to fill the Star Bank. By collecting Stars, Mario and friends are able to obtain pages to the Miracle Book. After the Miracle Book is filled out, Brighton and Twila see the Star Bank, filled with Stars. Noting how hard Mario and friends had worked to obtain the Stars, Brighton and Twila apologize to them for the hassle their quarrel had caused, and make up. To show their appreciation for the effort, the hosts send the Stars flying into the sky. The ending goes on to state that Brighton and Twila "watched over Mario Party world until the end of time," and that "everyone got back to partying as usual." The words "Party On!" then appear on the screen. Wario about to hit a Dice Block. Mario Party 6, as with previous installments of the Mario Party series, plays as an interactive board game, where up to four players take turns rolling Dice Blocks with numbers 1-10, the number indicating how far they can travel. The goal of the game is to earn coins to buy the Stars, which are dependent on the board's rules. In the beginning of every game, players are introduced to the board, where they are asked to hear about the board and any unique quirks it may have. The game then determines the order the players go, by hitting Dice Blocks, where higher numbers mean players go sooner. At the beginning of every game, players receive 10 coins to start with. During board gameplay, players can obtain various items called Orbs, very alike to Mario Party 5's capsules, from either purchasing them from Orb Huts, passing Orb Spaces, or winning them by landing on ? Spaces to help themselves and/or hurt the other players. At the end of every turn, a mini-game is played, where the type of mini-game is determined by what color the space the players have landed on. All mini-games have their own controls and objectives, which are outlined prior to playing them. Winning players receive 10 coins from mini-games; however, certain types of mini-games such as bonus mini-games offer different prizes. After the mini-game is completed, the game is saved, and players return to the board to once again move around in. Various mini-games have special conditions to play in them: Battle mini-games occur at random, where number of coins are placed at stake where higher scoring players earn more coins; players also vote for minigames rather than have a roulette decide for them, Duel mini-games occur when players either land on Duel Spaces or land on the same space in the last five turns, and DK and Bowser mini-games can be played when players land on the characters' respective spaces. When the last five turns has reached, a Last Five Turns Event commences, hosted with either Brighton or Twila depending on the time of the day. The current standings are tallied up, and the host brings in the fourth place player to spin the bonus wheel, which has many various effects, some greatly helping the last player. Another consequence is that players automatically duel each other if they land in the same space. After the last turn, the stats are tallied up once more, and Brighton and Twila give out bonus stars which are rewarded when players complete certain tasks. The player who has the most Stars wins the game, with coins serving as a tiebreaker; if the coin amount is also a tie, the winner is determined by a Dice Block. After the results, players can view various stats of each player, such as how many times the player has landed on certain spaces and line graphs depicting coin and star amounts throughout the game. Statistics revealed after the final results. One new mechanic introduced to the Mario Party series is the time of the day. In multiplayer boards, the game always starts out at daylight, hosted by Brighton. Indicated by a meter by the beginning of every turn and by the pause menu, players can see how many turns the day time has left. After the third time, day changes to night, which also lasts three turns. During the change, the board alters to reflect the setting of the day, while also introducing various gameplay changes depending on the board, indicated by small cutscenes. In this time period, Twila becomes the host. When three turns pass, the night changes to day once again, and the cycle repeats. After every session of either winning games or playing mini-games, Stars are rewarded, which are stored in the Star Bank. These stars can be used to buy various items of interest. Players can complete the overall game when they buy the Miracle Book and all individual pages. At the main menu screen, players can select different modes, represented by the objects placed on the screen. Modes on the left side are hosted by Brighton, modes on the right are hosted by Twila, and modes in the center are hosted by both. When players have a microphone attached, with the microphone settings enabled, players can say names of characters to make them react depending on what the player has said. Brighton and Twila greeting players in Party Mode. 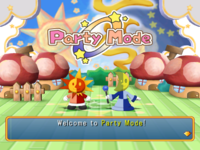 Represented by a house, Party Mode is the main mode of Mario Party 6, and it is hosted by both Brighton and Twila. Up to four players can play in this mode. 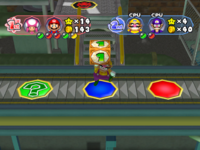 The mode uses the regular Mario Party rules while playing; players win by collecting the most Stars in the game. Battle Royale or Team Battle: Players can either pit against each other or form teams of two against each other. When players are teamed up, team one is represented by the sun while team two is represented by the moon. Teammates share Orbs, coins, Stars, and cannot be affected by each others traps; however, Chain Chomps in Snowflake Lake can still use up a teammate's Snack Orb, despite being on the same team. 1-Vs-3 mini-games do not appear in this mode. Number of Turns: Players can set the number of turns in a game ranging from ten to fifty in five-turn increments. Mini-Game Star: Most coins earned in mini-games. Orb Star: Most Orbs used. Event Star: Most ? Spaces landed on. Mini-game sets: Players can decide if they can play with all mini-games or with pre-determined set to play with in accordance to their categories. The following options are all, easy, action, hard, or weird mini-games. After players select from the available boards, choose their characters (computer characters can have their difficulty adjusted, from weak, normal, hard, and the unlockable brutal difficulties) and select a team, if Team Battle mode is enabled, players can set a handicap of giving players up to nine Stars to start with to give them an advantage. Once that is finished, players begin the game. Player Control: Players can change the control settings for each player. They can change the players into computers or vice-versa and change the computer player's difficulty setting. Mini-game Explanation Screen: Players can either view or automatically skip the mini-game explanation screen. CPU Duel Mini-games: Players can either view or automatically skip Duel Mini-games between two CPU players. Mini-game Sets: Players can change the mini-game set played, from all, easy, hard, action, or weird games. Rumble Feature: Players can turn controller rumbling on or off. Message Speed: Players can toggle the speed of the messages being displayed, from slow, medium, or fast. Mic: Players can turn the mic on or off. If the settings are turned on, Mic Mini-games will appear in the game. Quit: This quits the game. If the game is saved, players can resume the game from the last turn played. Brighton introducing players to Solo Mode. 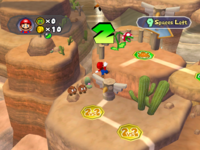 Mario playing in Thirsty Gulch in Solo Mode. 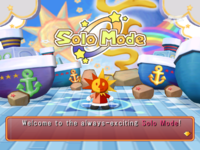 Represented by a boat, Solo Mode is a game mode hosted by Brighton. It is for one player only, and it has the character playing minigames against the Koopa Kids. The turn limit on these boards is set to 50 turns, although it is impossible to check this when playing the mode. There is also a change in the game's Solo Mode: players can roll a Dice Block that shows numbers only from 1-6 rather than the usual 1-10. The spaces on Solo Mode are different than those in normal modes of play. There are spaces for 4-player, 2-vs-2 (these are played teamed up with a CPU partner of the player's choice; but it can't be the same character as the player's), 1-vs-3 (the human is always the 1 player against 3), Battle, and Duel Mini-games. There are also Bowser spaces, which feature (normally 1-vs-3) games played against the Koopa Kids where all the players' coins are lost if they lose; ? spaces, which cause an event to happen; and the goals which are Rare Mini-Game spaces. Landing on one of these Rare Mini-Game spaces concludes the game and grants players one of the Rare Mini-games: Dunk Bros., Lab Brats, or Block Star. Seer Terror must be bought from the Star Bank. If the player goes past the Rare space, then the collected mini-games and bonuses are lost, and the game ends. Players can avert this by selecting to "Call it Quits" and keep everything they have earned so far; however, this ends the mode. Only two of the game's Orbs appear in this mode. One is the Sluggish 'Shroom Orb, which slows down the Dice Block so players can easily hit the number they want. The other is the Cursed Mushroom Orb, which makes the Dice Block only roll one through three. This can prevent players from walking past the Rare Mini-Game space. At the end of the mode, players receive any mini-games that are played during the mode if they are not unlocked previously. In addition, they receive bonuses at the end of the game for meeting certain criteria, such as playing ten mini-games during the game, rolling only even Dice Block numbers, or landing on every space on the board, which are paid out in Coins. The Coins are converted into Stars (one Star for every 20 Coins), which are then transferred to the Star Bank. This is a list of all bonuses that can be obtained in Solo Mode. A cumulative bonus indicates if it can be obtained more than once during gameplay, though there are a few bonuses that can only either be obtained a limited amount of times or once per board game. Brighton introducing players to Mic Mode. Speak Up: A quiz show-styled game where players can use the microphone to answer various questions. At least two players are required to play this game. Star Sprint: A single-player game where players use microphone commands to carry a Star to the goal, while they avoid obstacles. Mic Mini-Games: Players can play five special mic mini-games. All mini-games are 1-vs-3 mini-games, where one player uses the microphone, while other players play with controllers. If the mic is turned on in options mode, these mini-games appear in Party Mode, and Solo Mode. 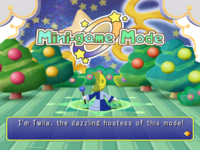 Twila, the hostess of Mini-Game Mode. 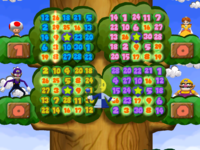 Represented by an apple tree, Mini-Game Mode is hosted by Twila and stores all mini-games that are unlocked in Party Mode and Solo Mode. Focusing on the mini-games, this mode features six different ways to play them. Mini-game Tour The Free-Play mode of this game, players hop on the Mini-game Tour Bus (while being driven by Twila) and can play any mini-game they have unlocked. Players need to unlock at least one mini-game to play this mode. Battle Bridge Players play a random assortment of a mini-game set to cross a bridge. The players can play with 4 player, 1-Vs-3, or 2-Vs-2 mini-games. Players can set a three, five, or seven mini-game match. Every time a player wins a mini-game, the player crosses the bridge; whichever player or team crosses the other side of the bridge wins the game. If the minigame ends in a draw or two or more people win, no one moves. To play Battle Bridge, players need to collect at least one 4 Player, one 1-Vs-3, and one 2-Vs-2 mini-game, excluding Mic and Bonus mini-games. Treetop Bingo The players' goal in this game is to win mini-games to complete rows of spaces on their corresponding Bingo board. Before playing, players need to set the amount of rows required to win the game. Every time a mini-game is won, players can claim a space on the board, which uncovers the other players' spaces on their Bingo boards. Players can occasionally earn lucky turns, which give them the ability to uncover two numbers. If a minigame ends in a tie, Twila decides the winner with a spinner. Players need to unlock at least one 4 Player mini-game to play this game. Mount Duel Four players play Duel mini-games in a tournament-style grid to climb and ascend onto a mountain. If players lose, they have to compete for the loser's round of being third instead of fourth. Players need to unlock at least one Duel mini-game to play this game. 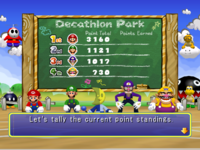 Decathlon Park Players play 10, set number of mini-games to compete with overall points. Whoever has the most points at the end wins the game. Decathlon Park high scores are recorded in the Option Mode. To play in Decathlon Park, players need to unlock the following mini-games: Smashdance, What Goes Up..., Circuit Maximus, Snow Whirled, Note to Self, Pokey Punch-out, Sunday Drivers, Throw Me a Bone, Hyper Sniper, and Stamp By Me. Endurance Alley A solo game where players play a set of 100 consecutive mini-games in a row for a high score; losing one mini-game ends the game. Players need to unlock it first in the Star Bank, and also have unlocked at least one 4 Player, one 1-Vs-3, and one Duel mini-game, excluding Mic and Bonus mini-games. 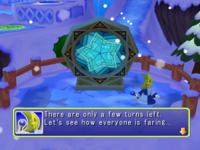 Represented by a windmill, the Star Bank stores all Stars players have collected during their playthrough of Mario Party 6. Here, they can exchange Stars for various goods, such as playable characters, boards, difficulty settings, secrets, and much more. Both Brighton and Twila host the mode, though Twila is the hostess who gives out descriptions. 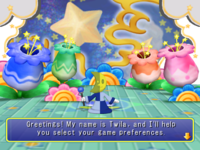 Twila introducing the Option Mode. Mic Settings: Players can toggle the microphone on, off, or by using the controller. When the microphone is toggled on or with the controller, Mic mini-games appear in Party and Solo Modes. While using the controller, players can press the to open up a menu of commands, where they can choose the command they want to use. Sound Settings: Players can set the sound setting to stereo, mono, or surround. Mini-games: Players can view which mini-games fall under each category of mini-games. Records: Board records, mini-game records, Solo Mode bonuses, Decathlon Park records, and Endurance Alley records are all stored here. Sounds: Players can listen to the various character sounds and background music of Mario Party 6. Additional sound sets can be bought at the Star Bank. Mic Test: This checks if the Mic is working properly. Mario Party 6 has eleven playable characters, all which are usable with no restrictions unlike its predecessor, Mario Party 5. 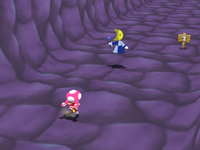 Mario Party 6 is where Toadette (marked with an asterisk) makes her overall debut in the Mario Party franchise, though in order to use her, she has to be unlocked by buying her for thirty Stars in the Star Bank first. Character specific colors are still used (an example being used in the mini-game, Note To Self), but the standard player order colors (red, blue, green, and yellow for players one, two, three, and four respectively) are far more abundant in labeling players than the character specific colors. In addition to returning all playable characters, Mario Party 6 returns team battle from Mario Party 5, as well as the accompanying team names. The following is a table of all possible combinations and team names. These characters appear either as part of the world-building scenery, as Orbs, as NPCs characters interact with in ? Spaces, as obstacles in various mini-games, or various other roles. There are 6 boards in Party Mode. 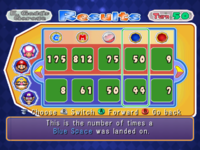 Some of the boards in Mario Party 6 have different objectives and goals to earn stars. Towering Treetop Players must move across this large board and try to arrive at randomly placed star first. Once the star has been bought for 20 coins, the star moves to another location. Day and night changes the paths along the board, making them longer or shorter. E. Gadd's Garage Players must move across this board and try to get to a randomly placed star first. Once the star has been bought for 20 coins, the star moves to another location. There are many gadgets and machines to experiment with in this board. Paths change depending on the time of the day. Faire Square Players have to move around this board to reach the Star Space. There is only one Star Space that never changes location, but players can buy up to five stars at a time if they have enough coins. The price of a star is always 20 coins during the day, but the price at night can be 5, 10, 30, or 40 coins, determined by the dice block Twila rolls. Snowflake Lake All players start with five stars, and then they must pay Chain Chomps coins to ride them and steal stars from other players in the process. When a player reaches a Chain Chomp's house, the player can pay it 20 coins for one dice block during the day and 10 for one dice block, 20 for two, and 30 for three at night to ride it. Castaway Bay Players must travel across the board to reach the end of the board. At the end of the board is either Donkey Kong or Bowser. If a player reaches the end of the board while Donkey Kong is present, then that player is given the opportunity to buy a star for 20 coins. Donkey Kong then switches positions with Bowser, and if a player reaches the end of the board while Bowser is present, then the player gets a star taken away by Bowser. If the player does not have a star, the player loses 20 coins. Clockwork Castle (unlockable) This board is can be bought for 100 Stars at the Star Bank. Players have to chase Donkey Kong around the board during the day to buy a star. After all four players have moved, DK rolls a Dice Block (two if he eats a banana) and move that many spaces. If a player catches up to or if DK catches up to a player, then the player can buy a star for 20 coins. At night, DK is replaced by Bowser. The movement on the board is reversed at night, and players need to move away from Bowser. Like DK, Bowser can use two Dice Blocks if he breathes fire. If Bowser catches up to or if a player runs into Bowser, then the player loses a star. If the player does not have a star, Bowser steals 20 coins. These are the three Solo Mode boards. They differ mostly in length, but they all have the same objective, which is to land on the Rare space located at the end of the board. Thirsty Gulch Like in all Solo Mode boards, the player has to stop at the Rare space on the end of the board in order to avoid falling into an abyss. ? Spaces in this board causes the player to fall into lower sections of the board, making it longer for the player to advance. This board is a desert theme, and it is the shortest of all Solo Mode boards. Astro Avenue Like in all Solo Mode boards, the player has to land on the Rare Space at the end of the board in order to avoid riding on the spaceship. ? Spaces in this board causes the player to advance closer to the Rare Minigame Space. This board has a space theme, and it is longer than Thirsty Gulch, and shorter than Infernal Tower. Infernal Tower Like in all Solo Mode boards, the player has to stop at the Rare Minigame space end of the board in order to avoid getting trapped in Bowser's cage. ? mark spaces causes Chain Chomps to knock the player back to the start of the board. This board has a Bowser theme and it is the longest of all Solo Mode boards. Blue Space When players land on this space, they receive three coins. On the last five turn event, the coins players receive get multiplied by three if the losing player stops the roulette wheel on this event. Red Space When players land on this space, they lose three coins. On the last five turns event, the coins players lose get multiplied by three if the losing player stops the roulette wheel on this event.
? Space When the player lands on this space, an event happens. The event varies on location and board. The event may help or hinder the player or everyone. Duel Space When the player lands on this space, the player chooses who to duel with. After the opponent has chosen, the player who lands on this space gets to choose what to put at stake: stars, coins, or a star and 40 coins. Donkey Kong Space When the player lands on this space, Donkey Kong appears and causes events such as a mini-game where everyone can collect bananas for coins. The events may help the player or everyone. DK spaces change to Bowser spaces during the night. Bowser Space When the player lands on this space, Bowser appears and causes a series of events, such as forcing everyone to play a Bowser mini-game that can usually hinder the player who landed on this space or everyone. Bowser spaces change to DK spaces during the day. Miracle Space When the player lands on this space, a fortune event happens. Results may vary from giving coins to another player to swapping stars. Character Space This space is created by players throwing Yellow and Red Orbs into the board. The effect of the space is dependent on the Orb used. Yellow Orbs require players to stop while Red Orbs require players to pass. If the owner lands on this space, 5 coins are earned. Other players can overlap opponent Character Spaces with their own Orbs. The Character Space is represented by a profile of the character who owns the space or a team mark. Orb Space The player receives a random orb upon passing this space assuming the player is not on the final turn. This space does not count towards the Dice Block roll. Star Space The player has the option of buying a star if the player passes this space. Conditions of obtaining stars differ per board. This space does not count towards the Dice Block roll. Shadow Star Space Appearing only in Castaway Bay and Clockwork Castle, this space, if passed on, gives players a Shadow Star (aka a Ztar), thus deducting Stars (or Coins if the player does not have any Stars) from the player's amount. This space does not count towards the Dice Block roll. 4-Player Space Players play a 4-player mini-game. 1-Vs-3 Space Players play a 1-Vs.-3 mini-game. 2-Vs-2 Space Players play a 2-Vs.-2 mini-game. Battle Space Players play a Battle mini-game. Rare Mini-Game Space Players earn a Rare mini-game by stopping on this space, and it ends the game. It is the last space of any board. Bowser Space Bowser challenges players to a mini-game. If the players lose, Bowser may steal coins and mini-games earned. Duel Mini-Game Space A Koopa Kid challenges players to a duel mini-game. The color of the space determines the color of the Koopa Kid players will be facing against.
? Space When players land on this space, an event happens. The event varies on location and board. The event may help or hinder players. Orbs are items players can either collect on the board or buy. They can be used in many ways to give a player an advantage, such as setting traps on spaces to steal coins from rivals, to hamper a rival's progress, or to quickly obtain stars. Players can toss Red and Yellow Orbs to Blue, Red, or Character Spaces (though not roadblock Character Spaces) only, up to five spaces in front or behind them, and if a Star Space appears on a trap, the trap will be removed. All of these orbs affect the player or the Dice Block when the player uses them. These Orbs take effect when either the opponent passes or lands on it. The player who lands on it still have the effects of a Blue or Red space. The orb disappears once it has been activated. These orbs have an effect on a player who lands on the space. If the owner lands on the space, they receive five coins. During the Last Five Turn Events, the owner may receive 15 coins if the coin's ×3 roulette was chosen. The orb also stays on the board as long as no one replaces the orb or if a Star Space does not appear on it. These orbs protect the player from attacks such as Boo and Chain Chomp. They can only be found in specific boards such as Snowflake Lake. They cannot be thrown on a space or used. Instead, they are used automatically. They can be disposed at any time if the players chooses to, though. Mole-it!, one of the mini-games that has different rules depending on the time of the day. 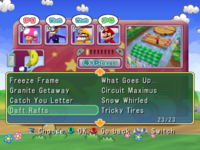 Mario Party 6 has a total of 82 mini-games, including the Mic mini-games that cannot be accessed in the Mini-Game Mode (instead it is accessible through the Mic Mode). It has more mini-games in total than its previous installments, and it has the third most overall mini-games in the Mario Party series, being tied by Mario Party: Island Tour and beaten by Mario Party 7 and Super Mario Party. As all installments of the Mario Party series, the mini-games have various puns and wordplays as their names. A feature exclusive to Mario Party 6 is that thirty-six mini-games can be played in either day or night. Only a few mini-games have their rules changed depending on the time of the day; most of these changes are simply aesthetic. Garden Grab in the Japanese version of the game. Brighton and Twila have voices in the Japanese version of the game. In the German version of the game, the genders of Brighton and Twila are inversed. Brighton is called "Sonnja", which is derived from a female given name and Twila is called "Raimond", which derives from a male given name. This is most likely because in German, the genders for the words sun and moon are inversed, too. The sun has a feminine article while the moon has a masculine article. The mini-game announcer voice is female from the previous two Mario Party installments in the Japanese version of the game. In the Japanese version of the game, the minigame Garden Grab features turnips. It was changed to a carrot in the Western version. Same Is Lame, Trap Ease Artist, Pitifall, and Trick or Tree are not available in the Endurance Alley in the European and Australian versions of the game. The time limit for Fruit Talktail is 72 seconds instead of 60 in the European and Australian versions of the game. 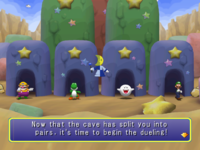 In the European and Australian versions of the game, the Battle Spaces have a lightning bolt instead of an uppercase B, somewhat resembling Mario Party 2's incarnation of the Battle Space. Mario Party 6 is developed by Hudson Soft, who was the primary developer for all Mario Party series installments until Mario Party 9, and is published by Nintendo. Shuichiro Nishiya directed the game, who directed the succeeding Mario Party games aside from the handheld Mario Party installments, barring Mario Party: Star Rush. Hironobu Yahata and Shinya Outouge were responsible for the game's soundtrack, who would both later compose Mario Party 7's soundtrack. Mario Party 6 received generally positive to mixed reviews from reviewers, receiving a 71 based on 33 reviews in Metacritic and a 73.41% based on 36 reviews on GameRankings. Much criticism is directed at the sheer similarity the game has to the previous Mario Party games, the lackluster single player mode, and the microphone voice recognition functionality. 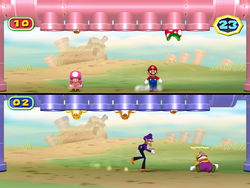 However, reviewers note that the game is fun with multiple players and that Mario Party 6 attempts to shake up the formula by including the microphone and other small new features. Peer Schneider of IGN has given the game a 7 out of 10. He notes how Mario Party 6 recycles many assets from the previous Mario Party games but has stated, "Mario Party 6 is a really fun multiplayer game when three friends are invited to the party." On a similar note, Ryan Davis of GameSpot has given the game a 6.9 out of 10,, also noting that the game is very similar to the rest of the series, but has also said that Mario Party 6 is an accessible multiplayer game to anyone and have a good time. He ended with: "Whether you've worn out your last copy of Mario Party or are just looking for a light, accessible multiplayer experience, number six is a fine pick. Alternately, if you have yet to be charmed by previous Mario Party games, this one isn't likely to change your opinion of the series." On the slightly higher end, Chris Kohler of 1UP gave Mario Party 6 a 7.5 out of 10. who writes that Mario Party 6 is generally fun, despite the reused formula, and ends by saying that Mario Party 6 is a polished upgrade with solid improvements. 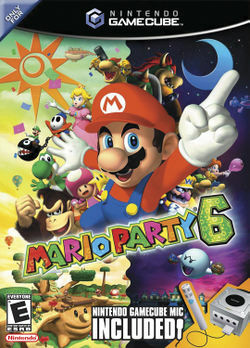 At the other end, Eurogamer's Ellie Gibson gave the game a score of 4/10, the lowest of the reviewers for Mario Party 6. She has complained about the game's dialogue, the mini-game titles, the microphone functionality, and the overall tedium of the game. She compared by saying, "All in all, if Mario Party 6 was a real party, it'd be one of those parties where there's nothing to drink but warm Heineken and no one to talk to but people who are having trouble with their boiler and students who've just spent three months in Thailand and want to tell you all about how they got dysentery in Chiang Mai, while a Savage Garden fan hangs round the stereo all night glaring at anyone who tries to suggest an alternative." Nintendo GameCube Nintendo Power 3.8/5 "Six boards and four gameplay modes give players plenty of options and hours of non-stop partying." Nintendo GameCube Peer Schneider, IGN 7/10 "But if you've played the previous two games already and you and your friends are hungry for more, don't think twice. Four-player games are still a blast. You just have to keep your expectations in check and expect more of less." Nintendo GameCube Ellie Gibson, Eurogamer 4/10 "Offers too much tedium and not nearly enough fun, mic or no mic." Nintendo GameCube Ryan Davis, GameSpot 6.9/10 "On the surface, Mario Party 6 seems to offer some of the biggest fundamental changes the series has ever seen. But this is really just a fresh coat of paint on an old building. Luckily for us, though, the building's foundation is still pretty strong." Nintendo GameCube Chris Kohler, 1UP 7.5/10 "The microphone mini-game selection is too small to make Mario Party 6's appeal that much wider. But for those who appreciate sitting down for a long night of Star collecting and raucous behavior, Mario Party 6 is a polished upgrade with solid improvements." Nintendo GameCube Bryn Williams, GameSpy 4/5 "There's not really all that much new content in Mario Party 6 save for the microphone novelty, but in the end the final product feels more polished and enjoyable than both previous efforts released on the GameCube." Mario Party 6, from November 18, 2004 to January 30, 2005 sold 483,362 copies in America and 469,014 in Japan, ranking 10th in that time period. An early screenshot of Solo Mode. The Solo Mode originally used simple colored spaces, as opposed to the 4-Player, 1-Vs-3, and 2-Vs-2 spaces seen in the final game. An unused Orb called the Barrel Orb with the Orb ID 20 would protect players from dueling for one turn. There are no unique orb graphics and no activation text for this item. Various orbs are used for events, possibly for debugging purposes, but are taken out of the game. For this subject's image gallery, see Gallery:Mario Party 6. For a complete list of media for this subject, see List of Mario Party 6 media. Mario Bros.: Freezies appear in Snowflake Lake when night falls. Super Mario Bros.: An 8-bit Mario appears in Snowflake Lake. Super Mario World: ! Switches appear in the Orb Hut. Mario Party 2: Woody reappears in Towering Treetop. Paper Mario: Snow Bunny-like creatures and Whackas appear in Snowflake Lake. The Buzzy Beetle design in Slot Trot is designed after the Buzzy Beetle's portrayal in this game. Yellow Block-like blocks appear in Orb Huts. Mario Party 4: Animations have been reused from this game. Mario Party 5: Animations and certain sound effects have been reused from this game. Mario Party 7: Several covers of Mario Party 6 music tracks appear in this installment. The main menu music is a slower-paced cover of Castaway Bay's music, the Speak Up tune can be heard when players land on the Mic Space, and the duel theme, Donkey Kong theme and minigame winning theme are remixed versions of the ones in Mario Party 6. Several sound effects are reused as well. Super Smash Bros. Brawl: Various artwork from this game have been reused as stickers. Mario Party DS: Block Star returns as one of the puzzle minigames. 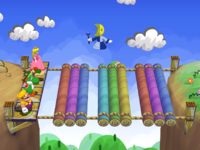 Parts of the minigame's tune can be heard in Mario Party DS's background music, "Think It Out", when playing any puzzle minigame. Mario Party 9: Several voice clips are recycled in this game. Mario Party: The Top 100: Nine minigames return in this game. A cover version of the minigame completion theme plays when completing any of the nine Mario Party 6 minigames. Brighton and Twila make a cameo in the Characters section of the Series Guide. Mario Tennis Aces: Mario's artwork from this game is reused on one of the large banners. This is one of the three Mario Party games since Mario Party 2 to not have a boss battle. The others are Mario Party Advance and Super Mario Party. ↑ Mario Party 6 Metacritic score. Metacritic. Retrieved August 22, 2016. ↑ Mario Party 6 GameRankings score. GameRankings. Retrieved August 22, 2016. ↑ Schneider, Peer (December 8, 2004). Review of Mario Party 6. IGN. Retrieved August 22, 2016. ↑ Davis, Ryan (December 6, 2004). Review of Mario Party 6. GameSpot. Retrieved August 22, 2016. ↑ Kohler, Chris (December 8, 2004). Review of Mario Party 6. 1UP. Retrieved August 22, 2016. ↑ Gibson, Ellie (December 7, 2004). Review of Mario Party 6. Eurogamer. Retrieved August 22, 2016. ↑ Web archive of Biglobe. (February 11, 2005). Biglobe. Retrieved August 22, 2016. This page was last edited on April 19, 2019, at 22:28.